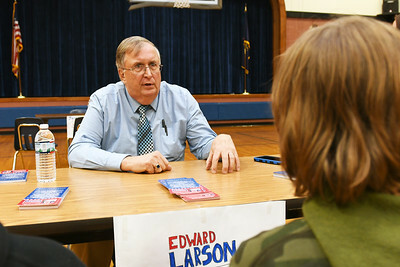 GOP State Senate Candidate Edward Larson, left, reads what the students at Barstow Memorial School in Chittenden wrote about him for the Election Day fair the school hosted with Larson and 11 other candidates seeking office in Vermont. 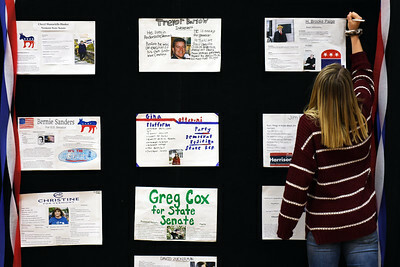 A Barstow Memorial School student puts finishing touches on her political research poster that covered GOP candidate for Secretary of State H. Brooke Paige. 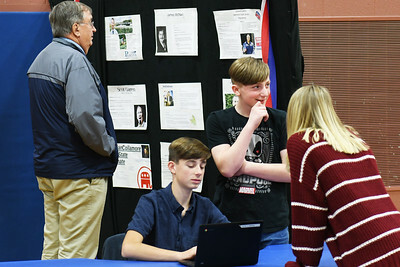 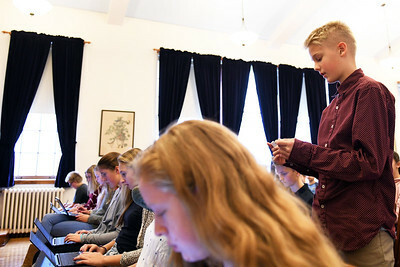 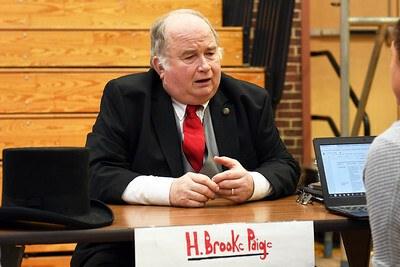 Students were given assigned candidates to research and write brief biographical and politcal briefs on them for an Election Fair at the school's gymnasium Thursday afternoon. 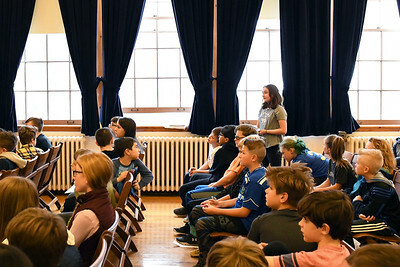 Democratic gubernatorial candidate Christine Hallquist answers questions from Barstow Memorial School students during a Q&A session as part of the school's Election Fair Thursday afternoon. 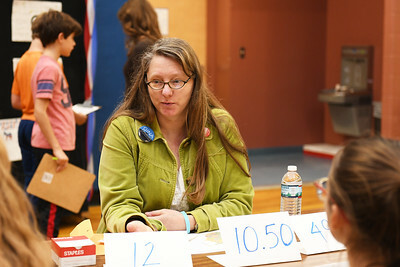 To her right is Jamie Gallagher, humanities teacher who helped organize the assembly of 12 politicians currently seeking office. 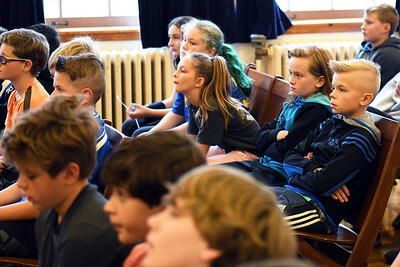 Barstow Memorial School students listen to Vermont Democratic gubernatorial candidate Christine Hallquist speak during a Q&A session Thursday afternoon. 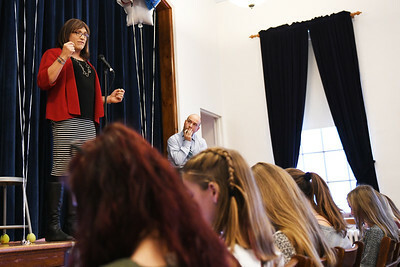 A Barstow Memorial School student asks a question about school safety to Democratic gubernatorial candidate Christine Hallquist during a Q&A session as part of the school's Election Fair Thursday afternoon. 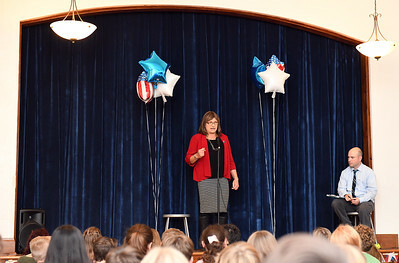 Democratic gubernatorial candidate Christine Hallquist answers questions from Barstow Memorial School students during a Q&A session as part of the school's Election Fair Thursday afternoon. 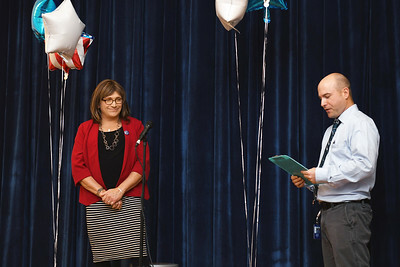 To the right is Jamie Gallagher, humanities teacher who helped organize the assembly of 12 politicians currently seeking office. 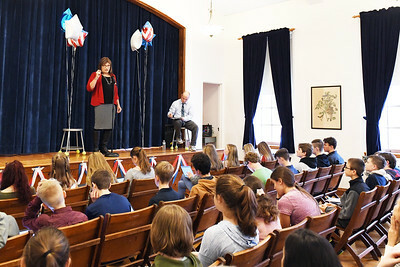 Barstow Memorial School student asks a questions to Democratic gubernatorial candidate Christine Hallquist during a Q&A session as part of the school's Election Fair Thursday afternoon. 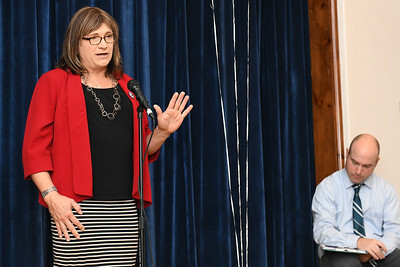 Christine Hallquist speaks with a reporter at Barstow Memorial School Thursday Nov. 1, 2018, following a Q&A session with students. 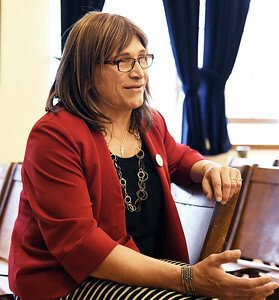 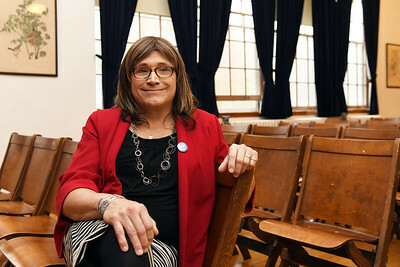 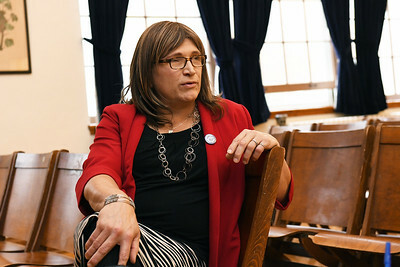 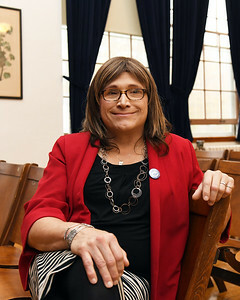 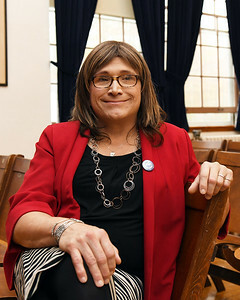 Vermont Democratic gubernatorial candidate Christine Hallquist poses for a photo at Barstow Memorial School in Chittenden Thursday afternoon. 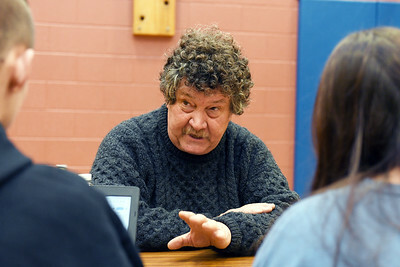 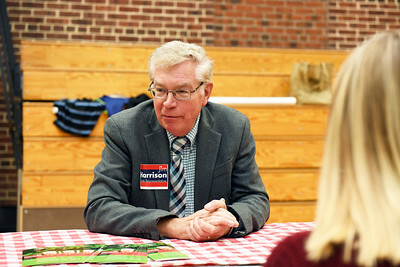 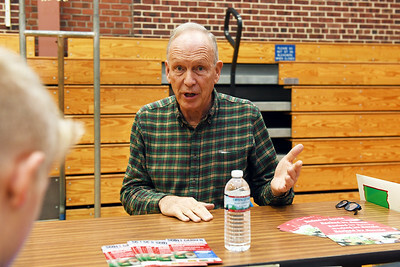 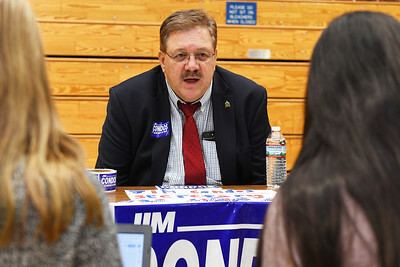 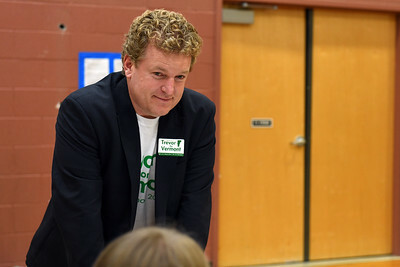 Vermont State Represenative James Harrison of Rutland-Windsor-1 speaks with Barstow Memorial students in the gymnasium Thursday Nov. 1, 2018 during a school wide Election Fair. 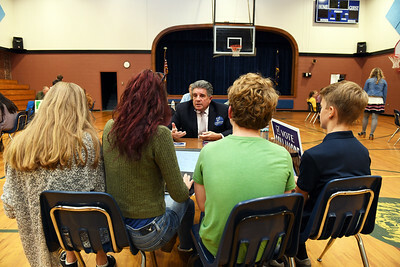 Barstow Memorial School students share a seat as they ask questions to incumbent State Senator Brian Collamore (R-Rutland) during an Election Fair day in the school's gymnasium Thursday afternoon.